The remarkable sensitivity of this hand held unit allows the user to detect sulfur hexafluoride to levels equivalent to 0.1 oz/year (3 grams/year). An advanced microprocessor is the heart of this unit. Its digital signal processing provides excellent management of the circuitry and sensing tip signal. The microprocessor monitors the sensing tip and battery voltage levels 4000 times per second, compensating for even the most minor fluctuations in signal. This translates into a stable and dependable tool in almost any environment. Convenience features have been incorporated into the 3-033-R002 to enhance its operation. Seven levels of sensitivity provide and increase of 64 times from level 1 to level 7. 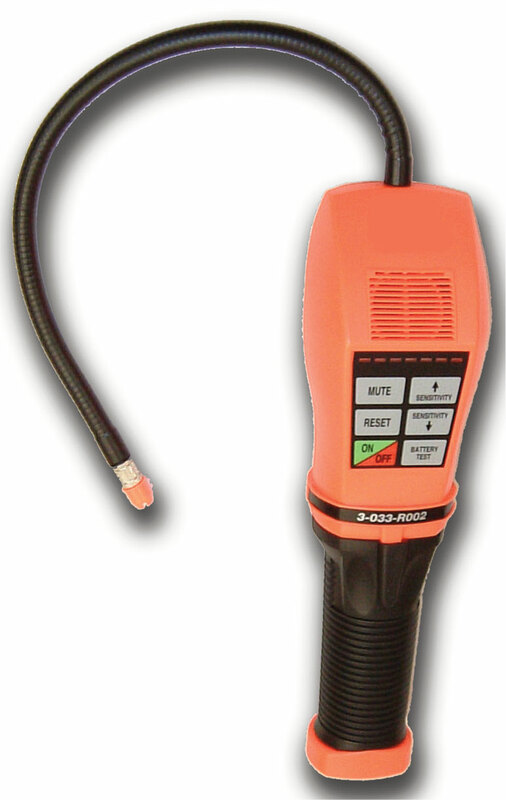 Unique tri-color LEDs show a progressive and wide range of leak size indication, communicate the sensitivity level, and provide a true voltage indication of battery power level. A tactile keypad controls all functions. The housing design provides the user with a secure grip and control and places the visual indicators in direct sight during use. Microprocessor control with advanced signal processing. Battery test function with battery voltage indication. True mechanical pumping ensures positive air flow through the sensing tip. 14" flexible stainless steel probe. Power Supply 3V DC - two “C” cell alkaline batteries. Operating Temperature: 30° to 125° F.